This is a pic from the celphone. I was too busy as the mother of the bride to do much else. We are having a wonderful time in Post Falls Idaho. That's only 180 miles north of Cottonwood, ID, where my second daughter got married. I'd go back in a minute! Great photo! I love it! Many Years to the couple and best wishes! One of ours lived in Coeur d'Alene for a few years--Idaho is lovely. I chose the cake, Steve chose the topper! 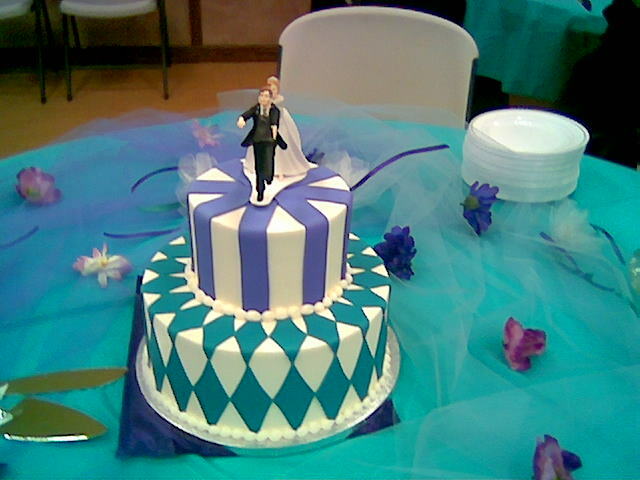 White Buttercream with ickk Fondant for the harlequin and stripes in our wedding colors, Purple and Teal. Top layer was white cake with Lemon Filling. Bottom Layer was Chocolate with Chocolate Mousse Filling. IT WAS DELICIOUS AND I WOULD GET MARRIED AGAIN JUST FOR THE CAKE!!! This page contains a single entry by alicia published on February 29, 2008 10:25 PM. From KUTV was the previous entry in this blog. worth reading this blog is the next entry in this blog.